The box is in place, the seeds have been planted, and now I have the pyjamas to match! Oh, how I looked forward to starting a blog post with those words. There has been a bit of a tidy up in my back garden in the last year. Basically the furthest section from the house is a bit wild, mainly because there is steep drop. For the last 20 odd years it’s all been obscured from view by a large tree, which I had cut down last July. 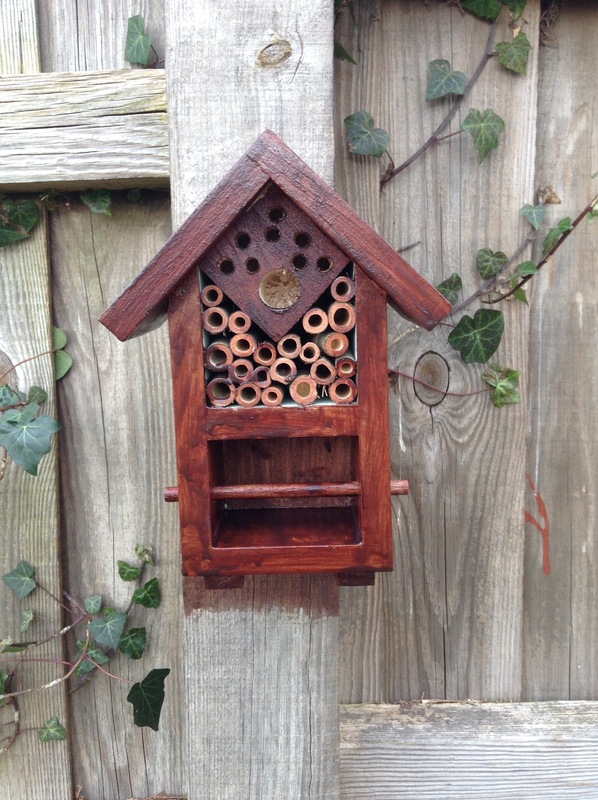 So now I can see the wild part of the garden, and decided that I would turn it into a mini wildlife reserve – which is grand way of saying that I got a bee box for Christmas, which is now in position and ready for baby bees next year. It’s not a bee hive. There won’t be any honey. This is about solitary bees. The ones that are crucial to the ongoing existence of a lot of vegetation by spreading pollen. So I have planted some wild flowers as well in the hopes of attracting bees. 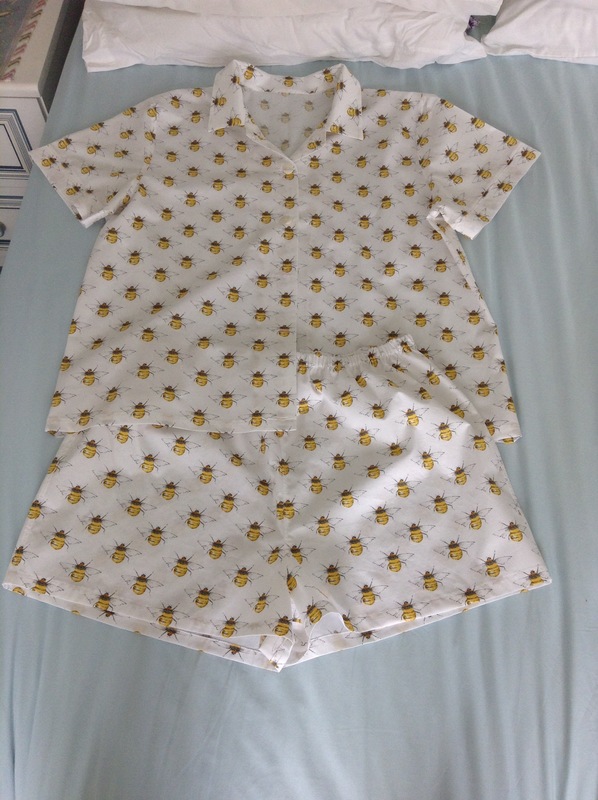 So I went to Sewing for Pleasure with the intention of looking for some fabric for some short pyjamas for the summer, and I hadn’t been there long when I found this Rose and Hubble bee fabric. Perfect! Except that I hadnt been there long enough to have thought through how much 112cm wide fabric I might need. Well, the answer is that I would need more than I had bought. Now I was also on the hunt for some lingerie elastic, but left the show disappointed on that score (and remain disappointed still…) and amazingly, a recent eBay supplier of knicker elastic happened to also have 1m of bee fabric at a mere £5 a metre. It was meant to be mine. 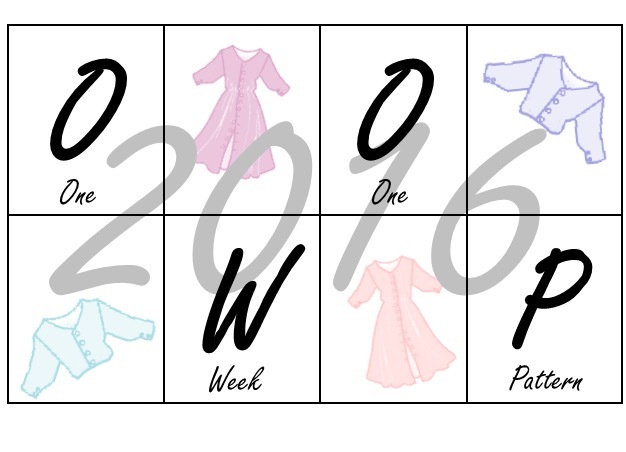 The pattern is Kirsten Martensson’s Kwik Sew 2811. 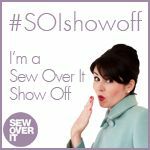 I don’t use Kwik Sew patterns very often. There were very few markings but I managed without them. My biggest gripe is that the seam allowance is only 6mm. 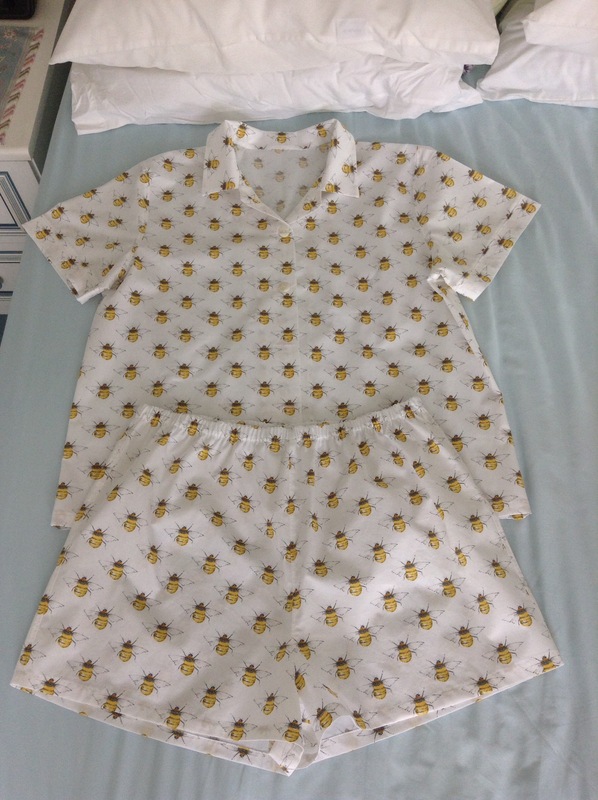 Now I was taught to make nightwear and children’s clothing with flat felled seams, and it’s very fiddly to sew flay felled seams with only 6mm of seam to play with. So I rather laboriously stitched each seam 3 times: on the machine, then stitched the seam allowances together on the overlocker, and then top stitched. I also don’t like the way that the facing is finished at the shoulder. I did miss a stage when I didn’t finish the shoulder facing on the overlocker…… So I ended up zig zagging the shoulder facing to the shoulder seam. I’ll see how well it survives as I roll from shoulder to shoulder during sleep. I actually made the sewing simpler than the pattern. I finished the shorts with elastic and missed out the ties. I only used one fabric, rather than creating a contrast collar and sleeve cuffs. 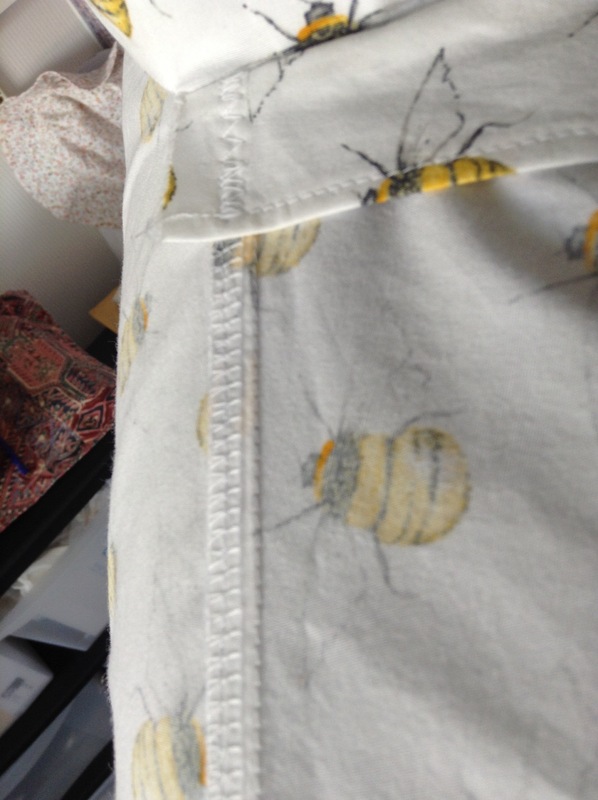 Note how I deliberately placed the bees carefully on both pieces. And I left off the pocket. I also haven’t top stitched round the edge of the facing, hoping it will be kept in place by the buttons and button holes. I can always go back and top stitch if it flaps about, but I don’t think that it will. Despite a bit of criticism above, I really like the results, and assuming they don’t fall apart after a few wears, I may well use the pattern again for both the winter and summer versions. This was made almost totally in the evenings after work; a new joy now that the clocks have changed and there is good light up to about 7:30 p.m. These are so cute. I love this fabric! 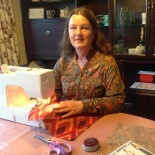 This entry was posted on April 3, 2017 by ann hebden in Fashion, Handmade, Kwik Sew, pyjamas, Sewing and tagged Handmade, Kwik Sew, pyjamas, rose and hubble, Sewing.